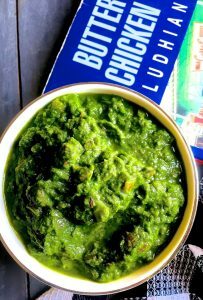 When Winter comes, can Sarson ka Saag be far behind! The ultimate greens dish, a classic from Punjab in Northern India and from the other side of the border. Prepare sarson ka saag by cooking the Mustard greens with spinach and bhatua saag. They are traditionally served with hot makki rotis, though they are great with phulkas or tandoori roti. Actually I like mine with hot rice and rasam! 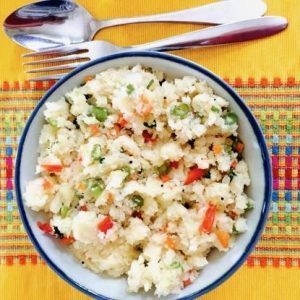 Vegetable Rava Upma – a favourite at our home. Usually though, most people avoid Upma and turn up their noses when its on the menu for breakfast or tiffin. After all, Upma is just semolina flour/ sooji / rava cooked in hot water and with salt and a bit of tempering. Sounds bland, doesn’t it? The addition of a judicious mix of vegetables, sliced thin, and the touch of ghee at the end (vegans please excuse this step!) makes all the difference to the taste. Almost a salad, this easy to make omelette is a breakfast staple at my house. The vegetables should be fresh and chopped fine/ minced so that they cook fast. The basil, oregano and ginger raise the omelette above the ordinary and the cheese gives it the perfect taste. As in most of my recipes, there is a contrast of colour, texture and aroma which makes this dish a treat…. You know how it is when since morning nothing goes right? Woke up with a headache when there was so much to do. Business appointment got cancelled for the 3rd time in as many days.I hadn’t done my weekly veggie shopping and it was too late to order online in time to prepare lunch. New driver didn’t turn up for work so I couldn’t go to the store. However Bangalore weather decided to be merciful after the oppressive humidity of the last few days, and there was a pleasant breeze blowing in from my kitchen balcony. The Chinese chimes were ringing like mad. So I decided to get rid of my ill humour and make one of my favourite meals – Capsicum Morekuzhambu. Whenever I see these little kiosks or stalls with their proud banners advertising a 100 variety of dosas, I am tempted to stop and have a hot capsicum dosa. Its my favourite. And its actually so easy to make at home. This Capsicum Cheese Dosa makes for a quick and easy breakfast dish of dosa stuffed with capsicum peppers and cheese. A special occasion dish. Different coloured Bell Peppers (Capsicum/ Sweet Peppers) stuffed with mashed potatoes and cooked in a gravy of onions tomatoes and spices. Stuffed Shimla Mirch can be served with Rotis (chapatis) or as a side dish with rice and dhal, or with bread. This is my all time favourite, a Stuffed Shimla Mirch curry in a tasty gravy, absolute comfort food when the weather is chill. 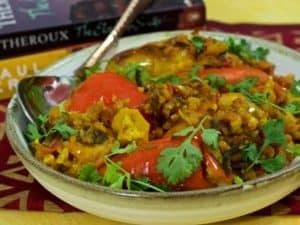 A delicious curry with the melding flavours of the mashed potatoes and spices and the textures of the peppers contrasting with the stuffing and the gravy. Grilled or fried peppers have a special flavour of their own. You could make the curry with just green capsicums, but with different coloured peppers generally available at Bangalore, I like to use a variety of coloured ones for this Stuffed Shimla Mirch.